Pioneer Insurance announced the winners of their #MoveOnLang Songwriting Competition at a concert night with live performances held at Hard Rock Café Makati last February 2. The Finals Night was attended by guests from the Filipino Society of Composers, Authors and Publishers (FILSCAP), ABS-CBN’s One Music PH, and Pioneer’s Professional Sales Agency. 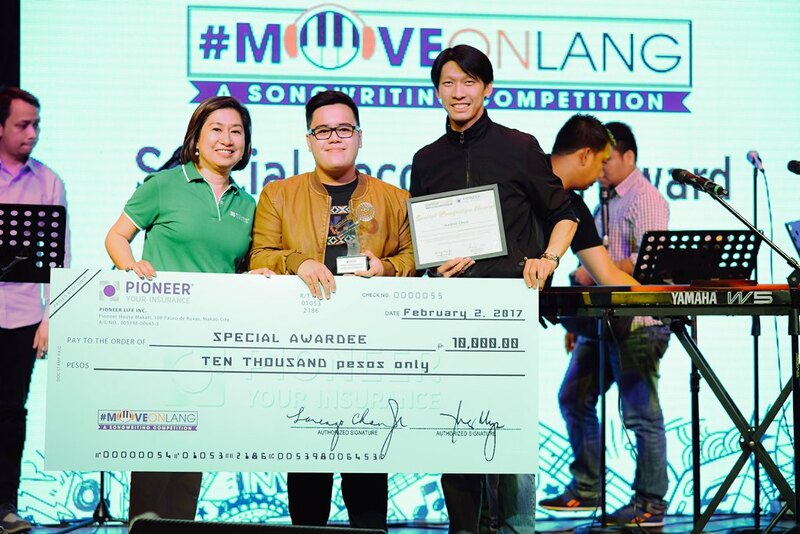 Benjamin Quijano (“Aking Mundo”) from University of the Philippines Los Baños won PHP 50,000 as first runner-up. 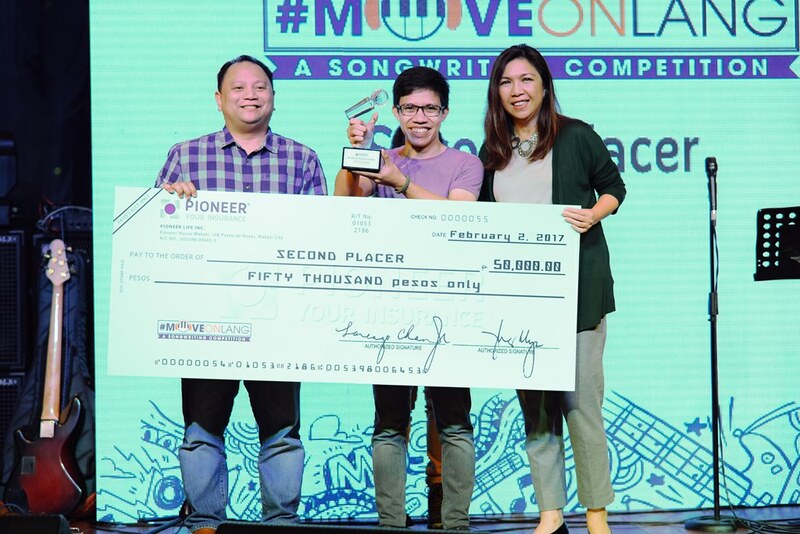 Kenneth Roquid (“Alive”) from University of the Philippines Diliman won PHP 30,000 as second runner-up. The ten #MoveOnLang finalists performed their song entries in front of a panel of judges which included One Music PH Editor-In-Chief Joy Mesina, FILSCAP President Rico Blanco, FILSCAP Chairman Arturo Lui Pio, FILSCAP Trustee Noel Cabangon, and Pioneer Life Inc. President Lorenzo Chan Jr.
To recognize the songwriting prowess of the remaining seven finalists, Pioneer awarded PHP 10,000 each to CK Sabillo (“Chronosphere”) from University of Santo Tomas, Julia Dichoso (“Hand In Hand”) from Sorsogon State College, Julien Cloma (“From Now On”) from STI College Novaliches, Luigi Balazo (“Make It Through”) from University of San Carlos, Marie Salvaleon (“Martsa Ni Marta”) from Southwestern University PHINMA, Marie Tayag (“The Biggest Leap”) from De La Salle University Manila, and Patricia Monsod (“Time”) from University of the Philippines Diliman. 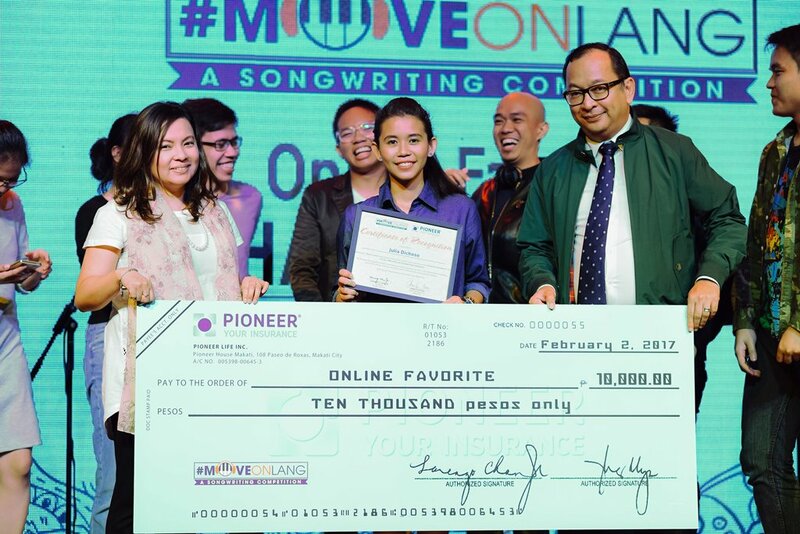 Julia Dichoso’s song “Hand In Hand” received 44.96% of online votes and was crowned as Online Favorite, for which she was awarded PHP 10,000. 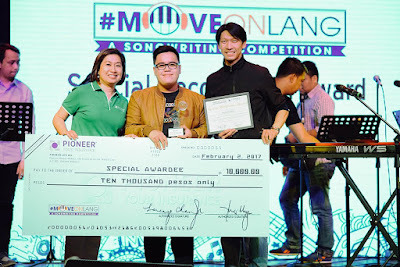 Pioneer also gave a Special Recognition Award and PHP 10,000 to Drei Chua of San Beda College Alabang for his song entry “Bangon,” an exceptional composition that perfectly describes Pioneer’s message of hope to its clients. Aside from the cash prize, all winners received PHP 100,000 worth of insurance coverage from Pioneer. 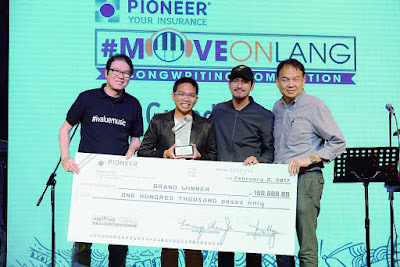 Pioneer launched the #MoveOnLang Songwriting Competition in partnership with FILSCAP and One Music PH to encourage the youth to pursue artistic endeavors and to celebrate the Filipino trait of resiliency. Applicants were challenged to write a song expressing their take on resiliency in 3 minutes or less. 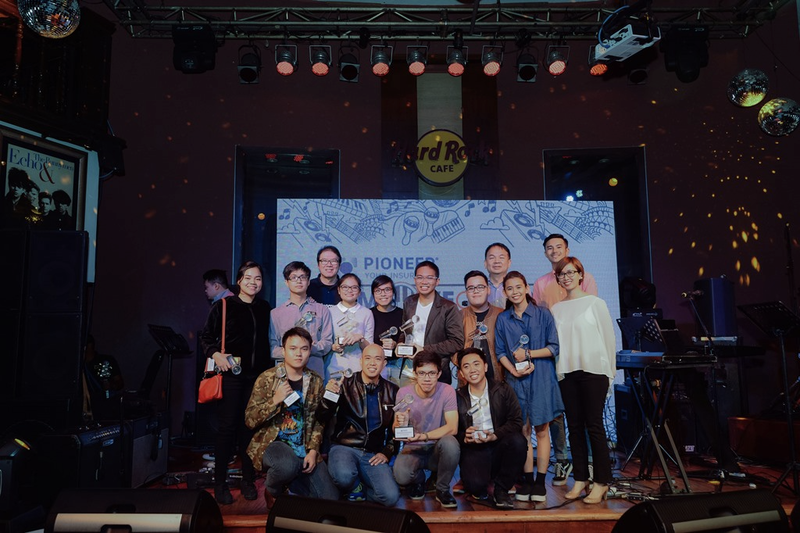 A total of 150 song entries were screened from colleges and universities all over the country, but only ten were selected at the Preliminary Judging conducted by FILSCAP. 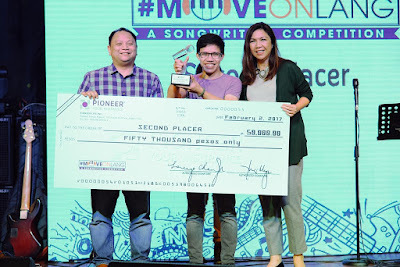 “We love doing contests like this because it allows us to connect with the youth and inspire them to pursue the arts,” says Pioneer Life Inc. President Lorenzo Chan Jr. “By partnering with FILSCAP and One Music PH, we managed to provide songwriting expertise and the best launching platform to the up-and-coming #MoveOnLang songwriters. 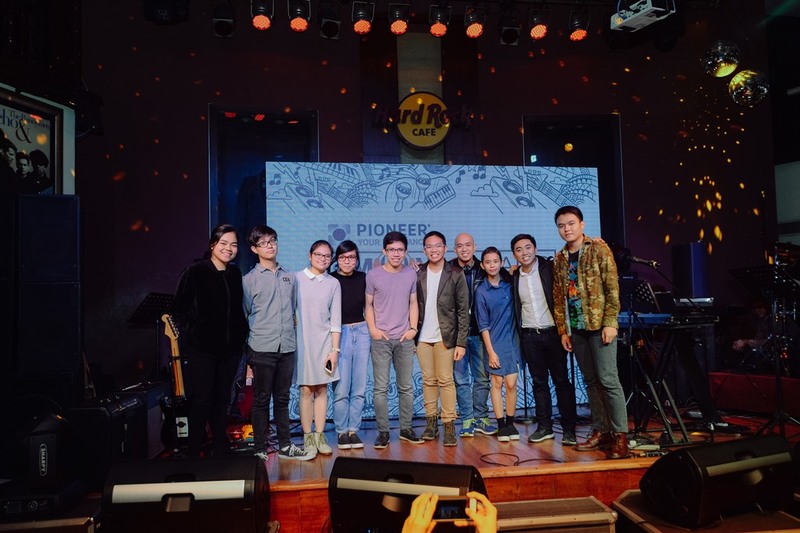 Pioneer will continue to support the arts with our contests, and we’re extremely excited for our next initiative to promote the arts,” Chan shared. Watch the coverage of the #MoveOnLang Finals Night on Pioneer Insurance’s Official Facebook Page (www.facebook.com/PioneerIsYourInsurance) and listen to the winning song entries on the official #MoveOnLang Website (www.moveonlang.ph) and Pioneer Insurance’s Soundcloud (www.soundcloud.com/pioneerph). 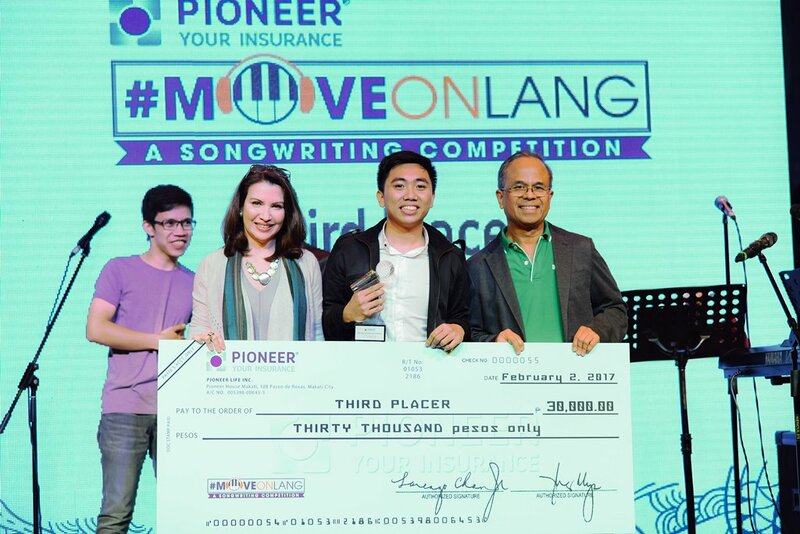 All 11 songs are also compiled in the playlist “#MoveOnLang (A Songwriting Competition),” available on Spotify, iTunes and Google Play.